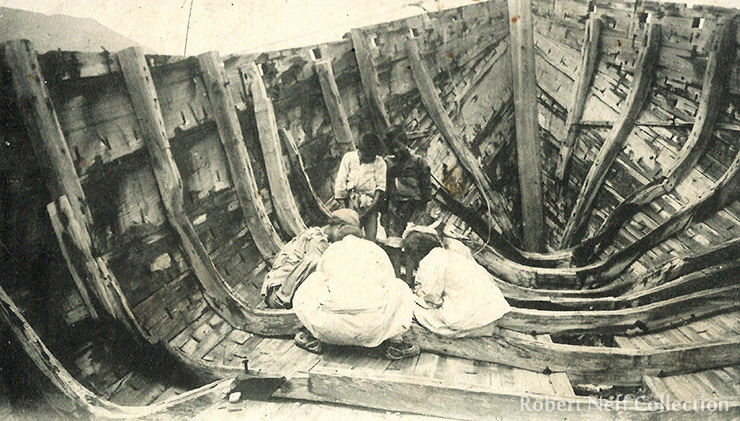 Building a boat, circa 1900-1920s. 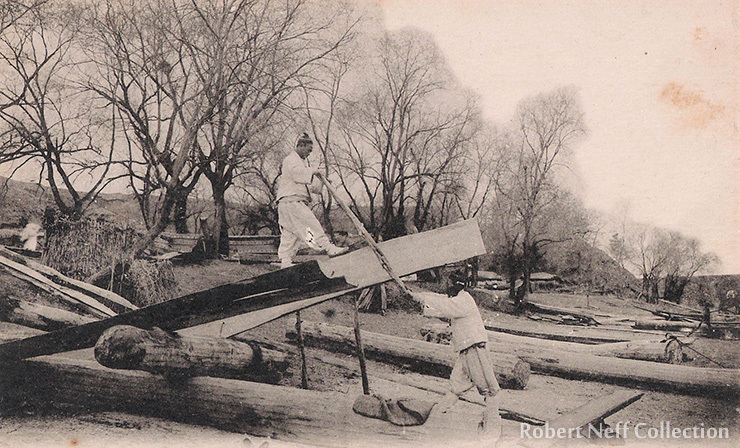 For hundreds of years during the Joseon era, Noryangjin was an important center for building Korean boats where, at least until the early 1930s, it was possible to see three or four generations of boat builders working and playing among the boats in various stages of completion. Horace H. Underwood, who wrote a book about Korean boats, observed that shipbuilding in Korea was done by a rule of thumb and "appears to have been … largely an hereditary trade of which the secrets [were] handed down from father to son and absorbed by the toddlers along with the smell of fresh cut pine and the sawdust and chips of the shipyard." Gambling during a break, circa 1900-1920s. "The boats are usually of extremely heavy build. In this as in their other features they are built to meet special conditions. "Extremely high rise and fall of tide, wide stretches of mud-flat and the sort, sharply breaking seas and the tide rips of the west and south coasts of Korea demanded a boat that could take a pounding, would carry both freight and sail and could be depended upon to ride the seas it had to meet and which would stay right side up when left by the tide as well as when afloat. These things the Korea boat does very well…"
There were many types of ships and boats built in these shipyards. Among the most important were the large junks used to carry government rice from the various ports about the peninsula. By the early 1930s, it was rather rare to see a 60-foot or 70-foot Korean transport junk but in the 1880s there were hundreds sailing up and down the Han River and around the peninsula. Judging from Korean Customs Service reports of that period, the ships were much larger ― some 200 tons and able to carry a 1,000 bags of rice. 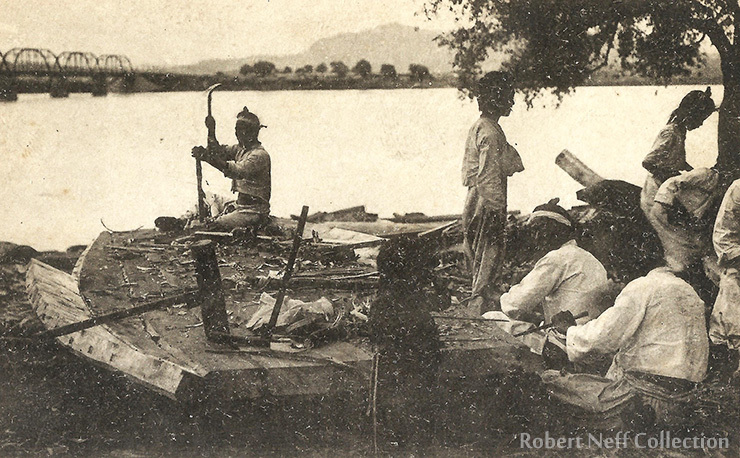 Working on a boat near Noryangjin, circa 1900-1920s. In 1884, a German in the employ of the Korean government examined a very large government junk ― it was about 130 feet long, could carry 1,300 bags of rice and had a crew of 15 to 20 men. According to him, the government junks were relatively inexpensive to build ― 262,000 to 400,000 in Korean cash (roughly 233-355 silver dollars). "This cheapness is explicable on the supposition that the government hands over the wood free of cost, as is stated, to the Provisional authorities who have to find the carpenters and other labor necessary for the constructions of the junks; so that the moderate sums mentioned probably only represent a small portion of the amount actually expended; because the lumber used up to build one of those junks, if sold in the Shanghai market, for instance, would probably fetch more than the nominal cost of the junk." Despite the costs, there were many private ship owners who made a fairly good living from their vessels. But not all costs were financial ― sailing along the Korean Peninsula was a dangerous occupation and many paid with their lives.